If your mind is set on an above ground pool, you need to get to the bottom of it and really get an understanding on all the things you need for having a nice swim for more than just a few weeks. Apart from the obvious pool ladders, there are some other important accessories that you may come to appreciate, especially after a cold swim. We’re talking about the tools and even systems that help you warm up the pool water, extending the time you spend in your swimming pool. This discussion doesn’t really concern you if you live in a warm climate where you don’t need to use an above pool heater (unless you’re really going for the sauna type swim). The best thing about the pool heaters is that not only they warm up the pool water, but they also extend the swimming season, no matter where you live (not North Pole, though). Long story short, if you live in a rather cool climate and you only get few months of swimming time, you definitely to get some help from a device/system to heat up your above ground pool. Now that it’s all clear why you need to heat up your above ground pool, let’s go over some of the best options for you out there. First thing? Take a good look at your wallet! The solar covers aren’t just easy to put on/take down and to us, but they are also highly cost effective. The principle is quite simple: they heat up during the day, holding the warmth over night. Typically, they are UV protected, which should expand their life span for more than just a summer. They minimize water evaporation and solar radiation at the same time, which is why they are both eco-friendly and cost effective. The entire process behind the solar covers may raise water temperature by up to 15 degrees- as long as you use them on regular basics. Another thing to keep in mind when getting a solar cover: the solar cover reel. You may want to use one, especially if you’re not the muscle type or your solar cover is thick and heavy weight. Additionally… Why get a terrible back pain when there are tools out there to help you? The solar cover reel also helps you store easier the cover when you’re not using it. The diversity of the solar covers is great and there are plenty of options when it comes to thickness, color and size. The twist on the solar covers? They may not last more than a few years due to the salt in the water. They may also crack/split from all of that folding/unfolding. All in all, as they aren’t very expensive and may serve you well for a couple of summers, the solar covers are a great option to warm up your above ground pool. 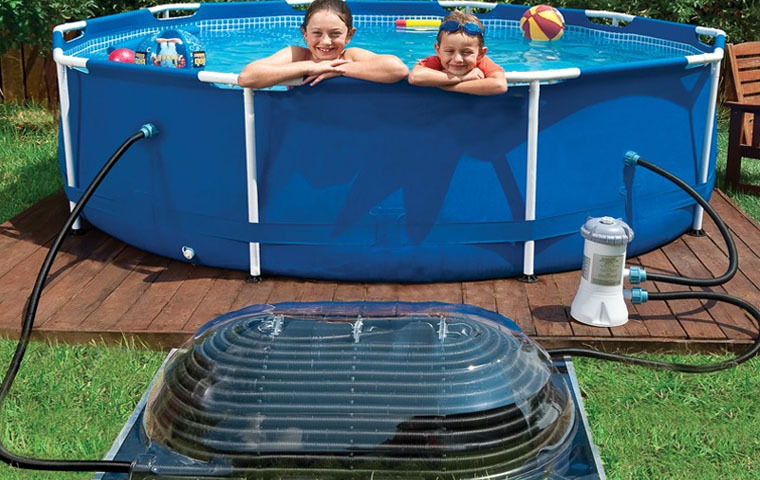 Using solar energy to warm your pool water, the solar heater is both an eco-friendly and a money saving choice when you have an above water pool. The principle for the solar heaters? The filter system of the pool pumps the pool water and passes it through the solar hot water collector, which typically is a flat box (you may mount it on a roof or a wooden rack also). The collectors already absorbed the sun’s solar rays, warming the water that goes through the unit. The solar heaters use directly the sun’s rays, needing only one-step to give you a nice swimming experience. 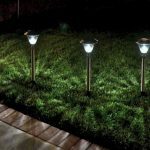 Depending on where you live, you may go for solar heaters with glass-glazed setups (for more efficiency) or get some with rubber/plastic parts. The solar heaters are easy to install and you need to place them directly in the sun, from 10am to 4pm. The catch? They may not raise the temperature as much as other systems and you do need some patience until you get to enjoy the results. Some say that this is the best way to warm your above ground pool, but let us have no winner on this one. The gas heaters may be efficient and fast, but checking the price tag helps, you understand our point of view. The gas heaters are highly dependable and quite safe to use, despite of what you may think. They warm your pool water fast and are easy to use. You simply connect them directly to your home’s gas line. You may also go for a propane pool heater in which case the connection is useless. This type of heater is self-sufficient and so easy to install. The market gives you many options and you can try a digital propane pool heater or settle for a manual one, if you’re ok with paying the effort. Easy to install and self-sufficient in most cases, the gas pool heaters should increase the temperature by one degree per hour of use. The main downside? Some talk about the water chemical imbalance that may damage the unit, but the price tag is also difficult to handle at times. It’s you and your needs, your wallet to decide which option works the best for your swimming pool. There are good options out there and you only need some patience to get one of them. 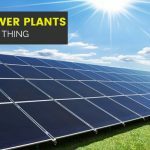 Solar Power Plants - The Next Big Thing?